Industry bodies and businesses are still poring over the 1,477-page document which outlines the new plan. 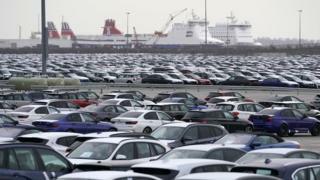 Imports of cars from the EU will have a tariff of 10% applied, which would add £1,500 to a typical family car. Volkswagen has already said the cost would be passed on to the buyer. A spokesman for Ford UK warned that the tariffs would “deal a devastating blow to much of the complex and integrated automotive industry, and would damage the competitiveness of Ford’s engine manufacturing in the UK”. While some tariffs will protect farmers producing meat, other sectors of farming will have low or no tarrifs. The National Farmers’ Union President, Minette Batters, said that eggs, cereals, fruit and vegetables would not receive any protection under the plans. The plans would see the current tariff rate on oranges cut from 16% to 0%, the rate for onions down from 9.6% to 0% and the tariff on imported televisions down from 14% to 0%. Carolyn Fairbairn, director general of the CBI described the changes as “the biggest change in terms of trade since mid 19th century”. Why is the government planning to cut tariffs?